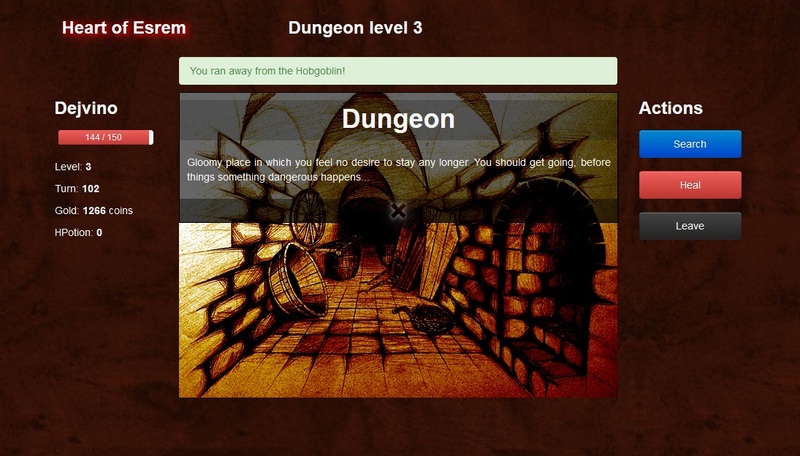 Web-based, single-page, AJAX-powered game. Simplified RPG dungeon exploration. Get to the deepest level possible without being killed! Built with PHP + Nette Framework and MySQL built with Bootstrap. 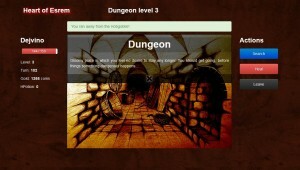 The idea is to have a full-featured RPG game with only a minimalistic set of controls. The name of the game is actually an abbreviation: Heart of Esrem = Heart of Every Single Rpg Ever Made. Because what you really do in every RPG game is exploring, fighting, running away, drinking health potions, getting a better equipment, … All of this can be achieved using a few buttons and a random generator. Status: bare-minimum core done, not yet enjoyably playable.